Vintage From Paul is pleased to offer this sparkling, vintage crystal Nachtmann Bleikristal Astra Double Old Fashion Glass Set. There are four (4) Double Old fashion Gasses in this set. 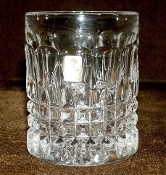 The Nachtmann Bleikristal Astra Double Old Fashion Glasses are of 24% leded crystal. Each of the four Nachtmann Bleikristal Astra Double Old Fashion Glassses of this Setis in in pristine unused condition condition. The glass is sparkling and the reflection of light is amazing! The Nachtmann Bleikristal Astra Double Old Fashion Glasses stand 4 inches in height, measure 3-1/8 inches in diameter.